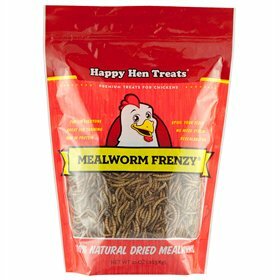 Dried mealworms are a natural product that chickens love! They're the larval form of the mealworm beetle, Tenebrio molitor, and are high in protein, vitamins, and high-grade edible oils. Wild birds, poultry (especially chickens), hedgehogs, squirrels, fish, reptiles, budgies, sugar gliders and countless other animals go crazy for them! Offer a small amount of these dried mealworms to your pets (or wildlife!) for a healthy, high-energy, high protein snack. As you know, extra protein makes an enormous difference to the number of eggs your hens lay in the winter and other times of stress. The additional protein is also great for helping feather regrowth during your flock's annual molt! Just remember, they should be thought of as a snack or treat, and never offered as your flock's main ration. Dried mealworms are probably the most popular treat that chicken keepers use to tame their birds. If you are offering these to young chicks, soak them in water first to make them easier to digest. Try scattering them around to encourage natural foraging--or feed them right out of your hands! 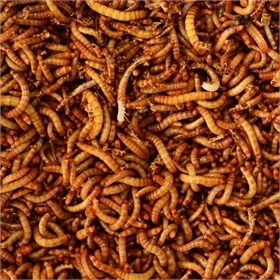 All of our dried mealworms are fully USDA and FDA approved. There are very strict rules on importing dried mealworms into the USA. All of our suppliers are registered with the FDA and all shipments come with certificates of origin and veterinary health certificates. This documentation needs to match the stipulations on our import permit otherwise the shipment will not be allowed into the country. All of the documentation has to be checked and verified by the US CBP, USDA and FDA, physical inspections and checks are also regularly carried out. All of these inspections ensure that the mealworms we sell are 100% natural, safe and of a high quality. We will continue to look out for suppliers in the US but until that point please feel safe in the knowledge that we are dedicated to bringing you the best dried mealworms on the market, at the lowest possible price.